Occupy Our Homes, an offshoot of the Occupy Wall Street movement, launched a national ad campaign this week aimed at inspiring beleaguered homeowners to battle foreclosure and eviction. The organization has created a foreclosure-resistance template and support network that it hopes borrowers will use to fight off repossession of their homes. The group has affiliates across the country, and some of them have already helped a number of distressed homeowners stave off foreclosure. Five of these homeowners appear in the ad, including a veteran, Bobby Hull, who obtained a loan modification after local OOH affiliates staged an extended sit-in at his property last year. AOL Real Estatereported on the sit-in in its early stages. 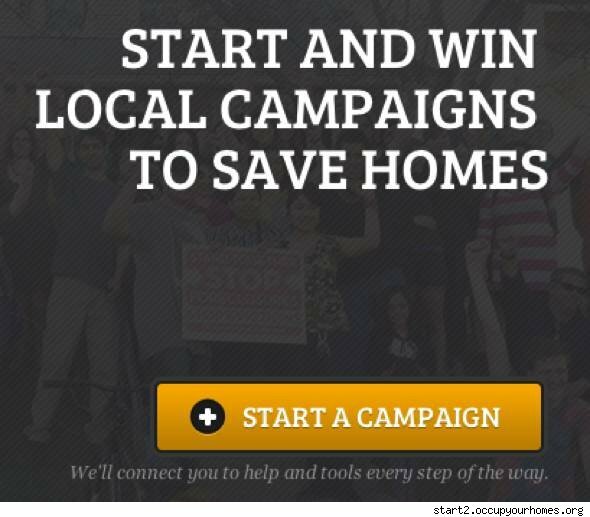 The ad closes with a plug for the group's website, OccupyOurHomes.org, which directs homeowners to the organization's affiliates and provides a field manual for battling foreclosure by using Occupy sit-in tactics. Visitors to the website can use an online tool called "start an occupation," which enlists the support of OOH groups committed to defending homeowners at risk of foreclosure. "When there have been cases that have come to light in various communities, we've seen a real uptick in interest of people reaching out to us for help, checking out the resources we have available," said Occupy Our Homes spokesperson Han Shan about the purpose of the ad. OOH said it raised $34,496 for the campaign using crowd-funding website LoudSauce.com. The ad, which will appear on networks including CNN, Fox and MSNBC, is part of the "Occupy Spots" project, a joint effort between Occupy Wall Street and LoudSauce.com "whose goal is to provide an alternative to Super PACs by funding ads by and for the 99 percent." "It's about trying to take to the airwaves," Shan said.